Xp Font Viewer is a Font utility. It uses a HTML for viewing fonts, installed on your PC:View all Fonts. Print the list of fonts. Print sample text of a Font. View sample text in all available fonts. Used the Windows clipboard. Copy and paste characters to another program Compare different fontsUsed system tray. Sorted fonts. View favorite fonts. Xp Font Viewer Â is a Font utility. It uses a HTMLÂ for viewing fonts, installed on your PC: View all Fonts. Print the list of fonts. Print sample text of a Font. View sample text in all available fonts. Used the Windows clipboard. Copy and paste characters to another program Compare different fonts Used system tray. Sorted fonts. View favorite fonts. Long awaited font viewer inside Creative Suite. Filtering several fonts from hundreds with one click. Compare and view fonts from your hard drive and then install font you need. Preview your text sample displayed with any font from disk. Tiny Font Viewer is the ultimate tool to preview all your system fonts. Tiny Font Viewer is the ultimate tool to preview all your system fonts. Increase or decrease the size add bold or italic to decide which Font to use for your next project. Preview fonts with bold and italic styles. Not all fonts look great with styles so now you can preview before you use! Purple Parrot Font Viewer provides information about the screen and printer fonts installed on your computer. Purple Parrot Font Viewer provides information about the screen and printer fonts installed on your computer. The program also provides the ability to view different sizes and effects for each Font, and the ability to view text that you type to see how it appears. Opcion Font Viewer is a simple font viewer that lets you view all your installed system fonts, using a sample text of your choice. Opcion Font Viewer is a simple Font Viewer that lets you view all your installed system fonts, using a sample text of your choice. In addition, you can also preview non-installed fonts, and view a list of all fonts. ImageXtender is free tweaking software that allows viewing more than 200 image formats in Windows XP image viewer. Once ImageXtender is installed, you can view images of most formats in 3 standard Windows modes - Preview, Thumbnails and Filmstrip. Preview the fonts you just downloaded, without spending too much precious time! With FontViewer you can say goodbye to long hours spent evaluating your brand new collection of fonts! And the best part is that you can install only the ones you like! 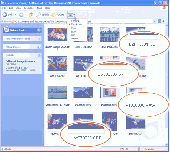 There are 4 glyph fonts in Windows: Webdings, Wingdings, Wingdings 2, and Wingdings 3. You can use these glyphs as easy as characters. FontSuit is a powerful font management tool, which allows you easily and quickly group and activate fonts only when you need them. Also, you can conveniently preview fonts in 5 different ways, print fonts sample sheet or print fonts catalog. This program is an easy to use but powerful font manager, which allows getting a quick overview of both installed and non installed fonts.